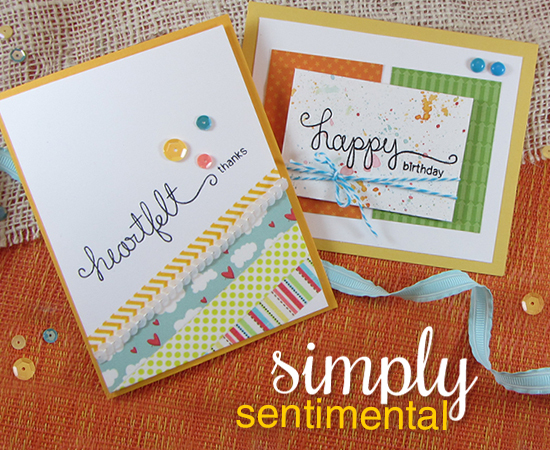 Today our second release day for August and we are featuring the set Simply Sentimental! 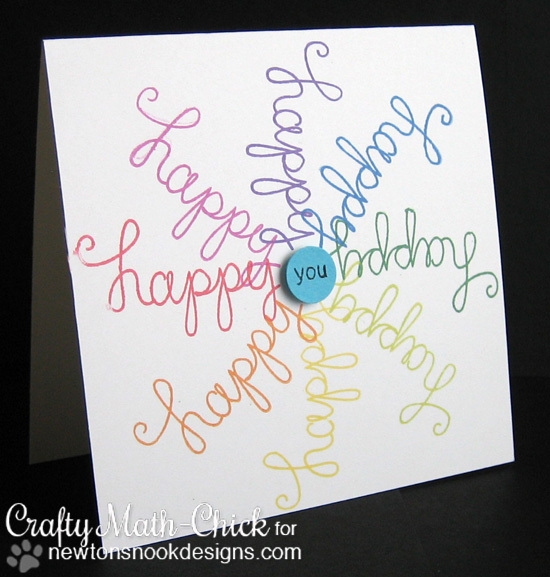 Our August Guest, Chitra Nair, created this cute border across the bottom of the card using the happy birthday words from this set. Then she combined it with the Koala Bear from our other new set, Hanging Around! 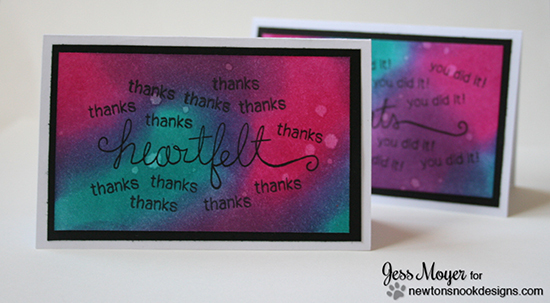 Jess created these fun cards using the fun mix of sentiments and some distress inks! 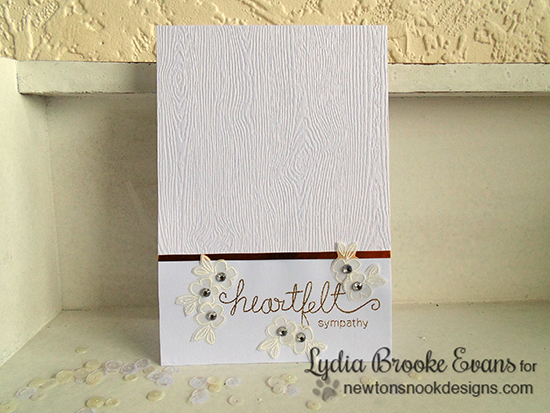 This gorgeous, clean card by Lydia uses the "heartfelt" and "sympathy" from this new set, along with the cute little flower image from our Beach Party stamp set. Gorgeous! 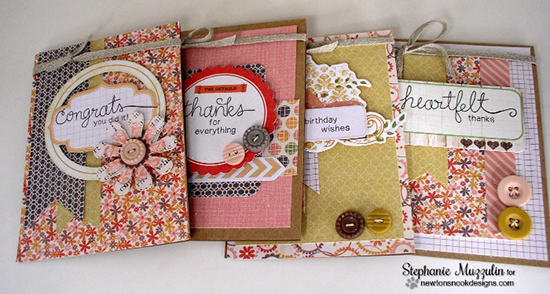 Love this set of gorgeous cards by Stephanie! She combined lots of different words together to make these great cards, mixing them with pretty paper patterns - something like this would make a great gift! 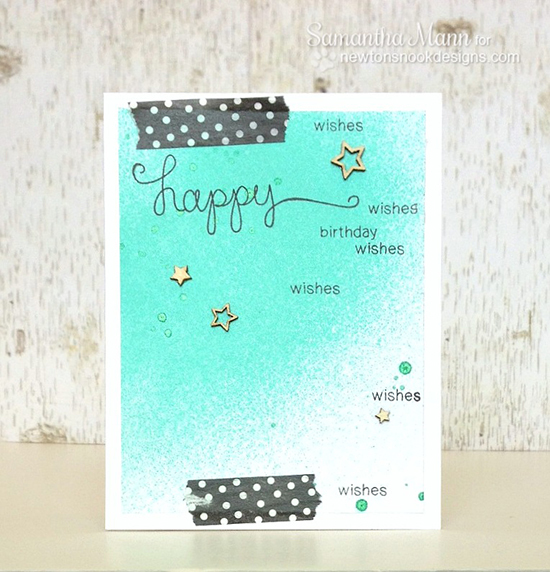 Here's a great birthday card by Samantha Love the fun background and the birthday and wishes stamped all over - super fun! Shellye combined our two new sets, adding the hanging kitty image from the new Hanging Around set right to the tail of the word "thanks" - I love how you can combine these sets together! 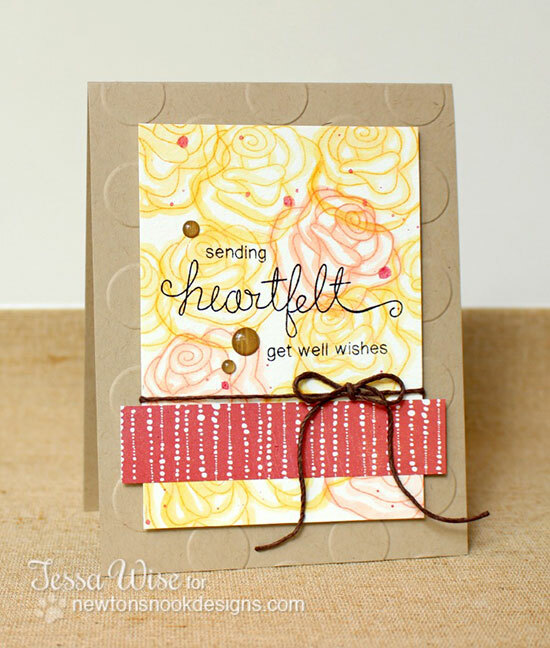 Such a pretty get well card by Tessa. She combined this set with our Love Grows set to create this beauty! 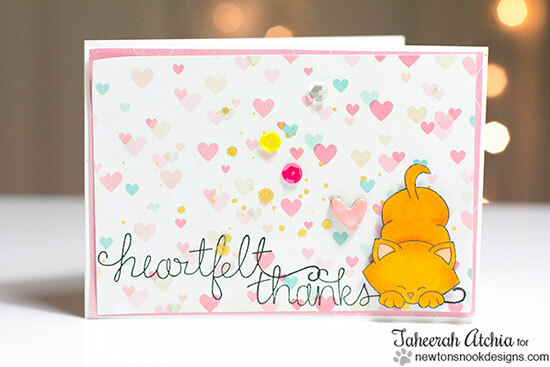 Taheerah created sweet thank you card using the large "heartfelt" and "thanks" sentiments from this new set and combining them with the kitty from the Newton's Antics stamp set! I love all the pretty hearts too! Here's a fun card by Danielle - this is so easy and simple - just add some patterned papers with the sentiment and you have a beautiful card! Crafty Math-Chick created this super fun and whimsical card! I love how she made a circle from the word happy in a rainbow of colors! Such a cute idea! Larissa created this adorable card. I love how she used the "heartfelt" sentiment to create a fun background - such a fun idea! She also used the cute koala from our Hanging Around set! Would you like to win “Simply Sentimental”? This set will be given away to TWO lucky winners! Love the fonts in this sentiment stamp set! Love the Heartfelt Sympathy card!! Great sentiment set. i really like the hand written sentiments and the variety in this set. 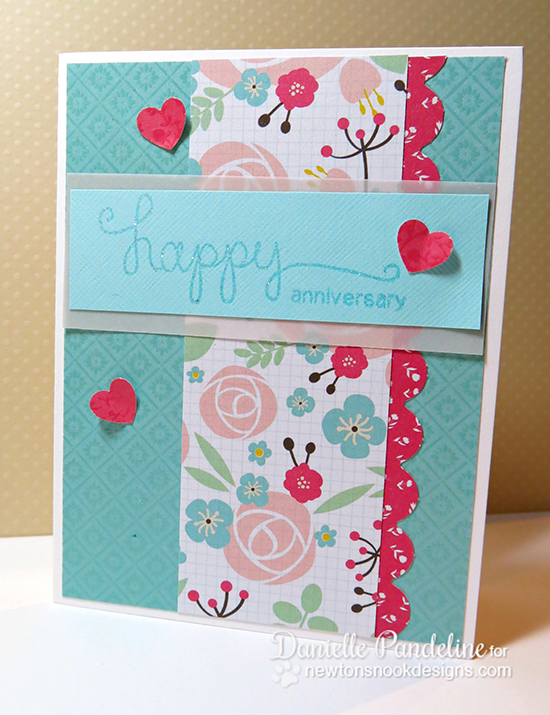 Great cards using the new Simply Sentimental stamp set. I LOVE this stamp set! I love the scripty front with the normal typeface, it provides so much versatility! Everyone's cards are amazing! OMGosh this set is the best. LOVE the font! Off I go for a closer look. 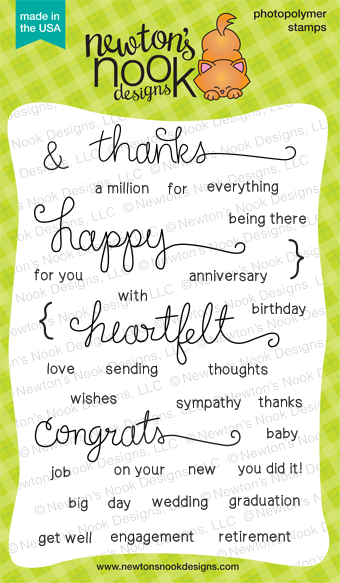 What a great bunch of sentiments in this stamp set! Love them all and the cards everyone made are perfect!! I love sentiment stamps, this one is awesome! Fabulous stamp set. Loved all the creations on today's hop. New sentiments fit so well with previous Newton released. Love the curly font. Fantastic sentiment set. So many choices. Like this sera a lot and the cards made by the design team are awesome. Yay for larger sentiments!!! Love it! Very pretty stamps, you can never have too many sentiment stamps. Amazing amazing amazing cards!! Love this set!! So excited for te August release!!! Great sentiment set! I just love all the ideas on the blogs. So many possibilities with Simply Sentimental!